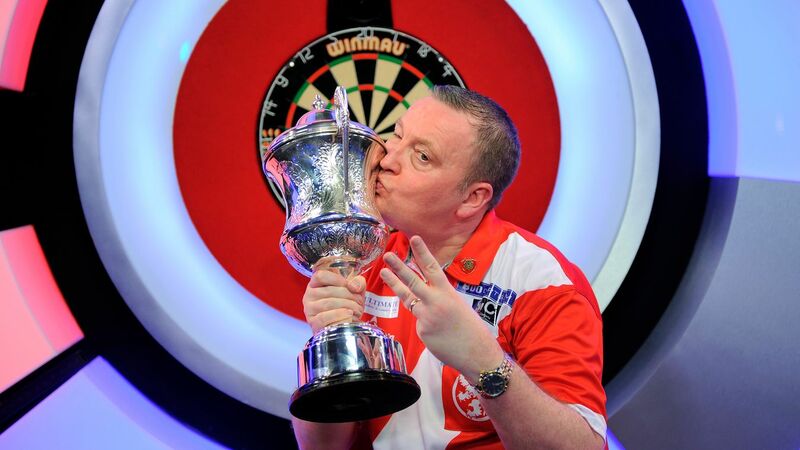 By adding to the titles he won in 2016 and 2017, the 48-year-old emulates the achievement of the late, great Eric Bristow, who lifted the prestigious trophy three years in a row from 1984-86 back when the BDO was unified. That fact wasn't lost on Durrant, who wasted little time in humbly playing down his incredible feat during the trophy presentation, but there can be no doubt that the affable and modest Teesider earns legendary status. He also becomes the first man to win three Lakeside finals out of three while this is the first occasion that the former two-time champion Waites has lost when the title has been on the line. Yet again on this stage, Durrant's consistent scoring power was too much to deal while his clinical finishing at key times proved crucial as he won four sets on the trot to seal his famous triumph. He averaged 96 compared to Waites' 91 while he also hit three more 180s with 13 and converted 25 of his 54 attempts at doubles. Waites, who lifted the trophy in 2013 and 2016, was making a real game of it in the first half of the match and is confidence was in full flow at 3-3 when landing his second 160 checkout of the tournament. The Yorkshireman is regarded as a player who produces his best on the big occasion but he would go on to lose that seventh set 3-1 and never really recovered, although he did force the last two all the way to deciding legs. He actually led 2-0 in the 10th but Durrant responded, with the help of a 114 checkout, before making Waites pay for missed doubles from Waites in what proved to be the final leg of the match. Durrant, who collects a first prize of £100,000, told Eurosport and Quest: "That means the earth and back and to do it against an absolute Lakeside legend like Scott Waites, that really was the icing on the cake. "I thought for four or five sets there he was much the better player and I just kept finding that double like I did against Jim Williams (in the semi-final) and I think I got just a little bit lucky. "Just remember Eric Bristow won it when it was a unified organisation. I know I'm not playing Michael Van Gerwen, Michael Smith, Gary Anderson, the works. "All I can do is beat legends like Scott Waites and Jim Williams so I'm mega-happy." Waites, who was also looking to win his third BDO title, added: "I am gutted about losing but we went into the break at three apiece and to be honest Glen didn't give me much of a chance after that. "I missed a few doubles and he didn't and that's why he's champion." Waites was advised at 25/1 each-way on Sporting Life but with him reaching the final, together with Jim Williams winning his quarter at 3/1, followers of the pre-tournament tips did at least earn some profit.